This is seriously one of the best things I’ve eaten in a while. I had such high hopes for this recipe, and am inordinately happy that I wasn’t disappointed. Sure, traditional pesto is made with basil, garlic, pine nuts, and parmesan, but the word basically comes from the Italian verb pestare, which just means “to pound or crush” (i.e. what you do with all these ingredients). Typically you’d make pestos with a mortar and pestle (from the same verb) but most of us are way too lazy to do that on a regular basis. Because food processors are magical. While I’ve tried kale pestos, spinach pestos, and all kinds of different nuts in the sauce as well, this is a very different take on the traditional dish. 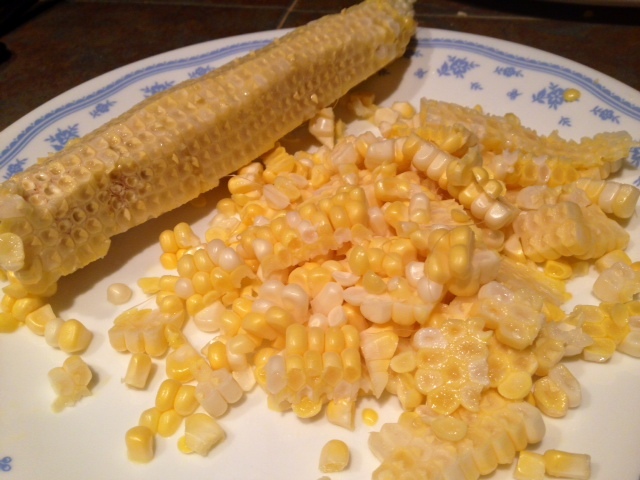 You start with sweet, juicy fresh corn cut right off the cob. Cook some bacon and leave the drippings in the pan to start the flavor profile. Saute some minced garlic in it to release its amazing aroma. Add a dash of red pepper flakes for just a hint of bite. 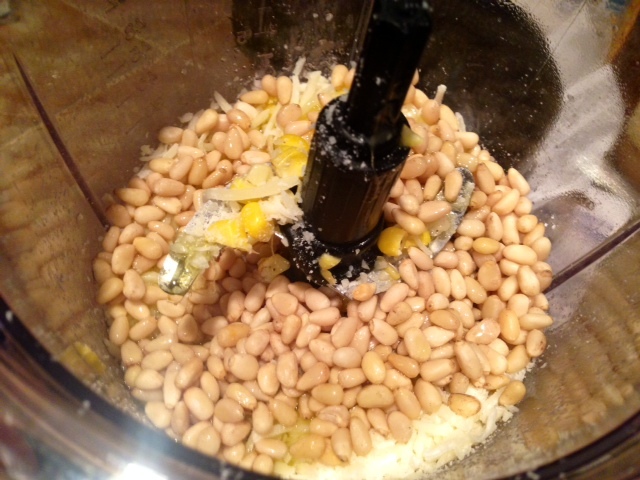 And finish it off in the food processor with pine nuts, fresh parmesan cheese, and olive oil to make a creamy sauce that clings to the noodles like its life depends on it. This dish doesn’t take long overall—the longest part is cutting the corn off the cob, which I’m pretty slow at (partly because I value my fingers). Once that part’s done, the rest moves quickly and you can have it on the table in less than half an hour. While you could use many different kinds of pasta, I think a long flat pasta like linguine or tagliatelle is best for this (though I break most of the noodles in half before cooking). 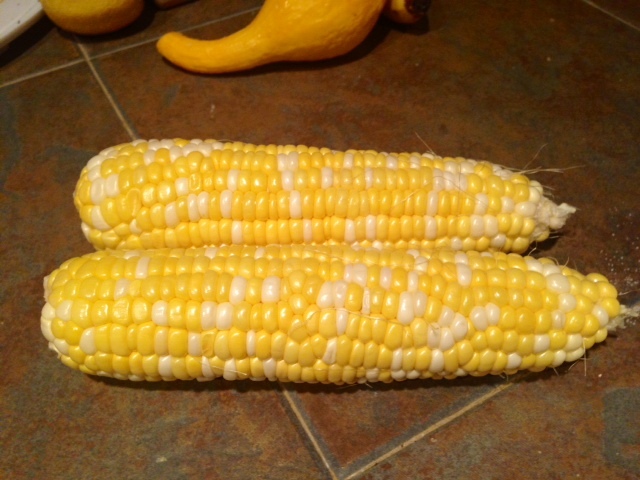 Cut the corn off the cob so that it’s ready to use when you need it. 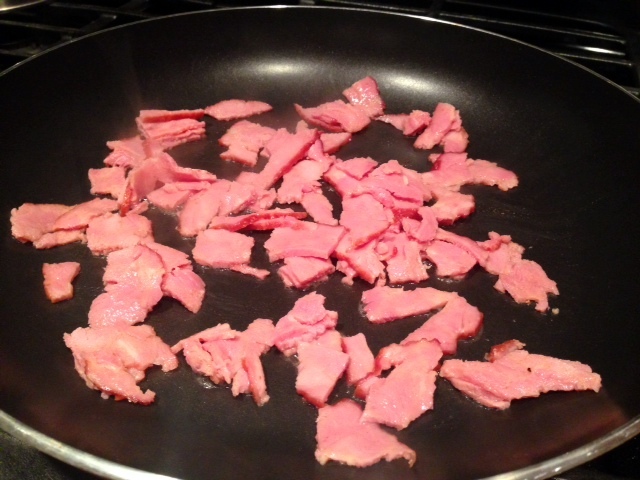 Cook the bacon in large non-stick skillet over medium heat until it’s crisp and brown, stirring often. If it’s pork bacon, use a slotted spoon to transfer to paper towels to drain (not necessary for turkey bacon). Pour off all but 1 tablespoon of drippings from the skillet. When the bacon’s done, set the pasta water to boiling. Cook the pasta in large pot of boiling salted water until just tender but still firm to bite, stirring occasionally (probably about 9-10 minutes). Reserve about 3/4 cup of pasta water, then drain. If you’re using turkey bacon, there won’t be many drippings, so add a few tablespoons of olive oil to the pan and add the minced garlic. 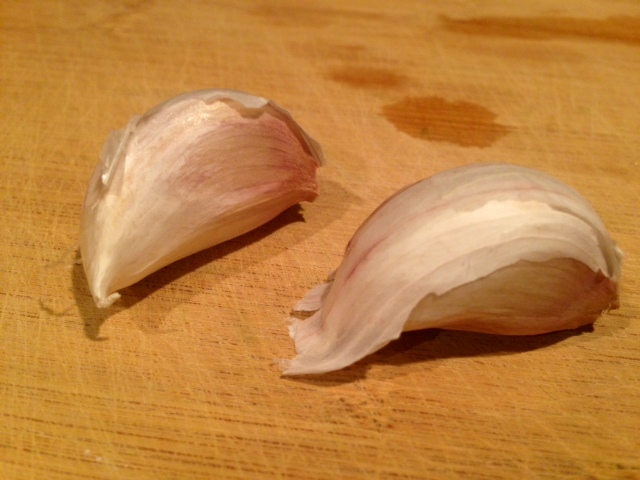 Saute for a minute, until the garlic is fragrant but make sure it doesn’t burn. Add the corn, sea salt, red pepper flakes, and fresh-ground pepper to the pan (and the rosemary if you’re going that route—I only used maybe a teaspoon at most since I didn’t want it overpowering the flavor). 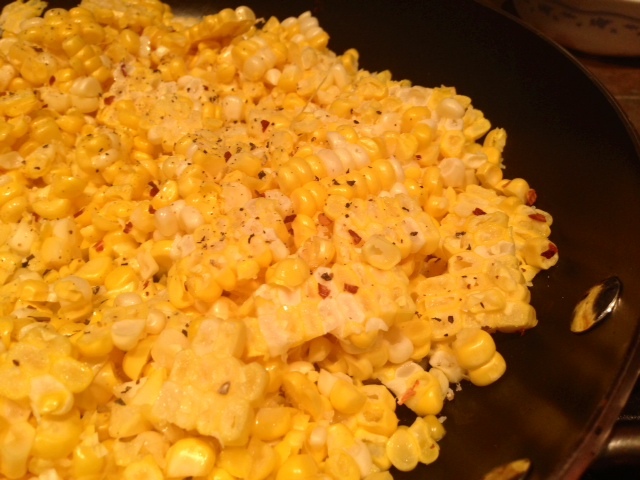 Sauté over medium-high heat until the corn is just tender but not brown. The original recipe says 4 minutes, but this took closer to 10 minutes for me, though my stove was probably on medium instead. 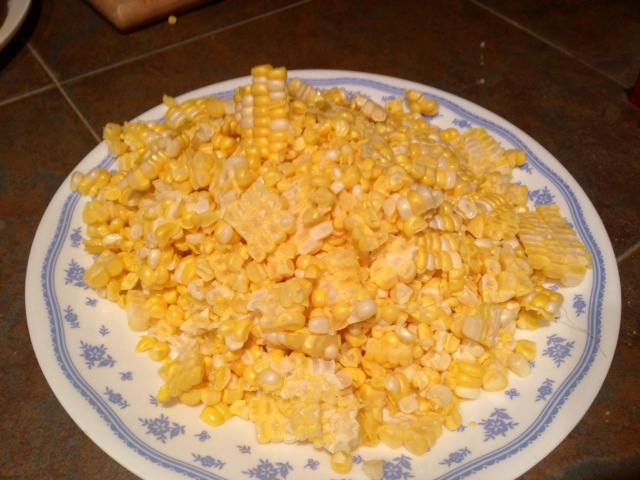 Transfer 1 1/2 cups of the corn kernels to a small bowl and set aside. 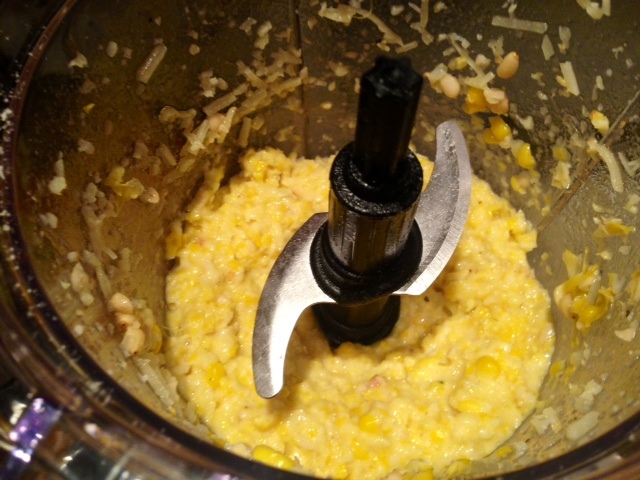 Scrape the remaining corn mixture into the food processor, then add 1/2 cup of Parmesan and the pine nuts. With the machine running, add olive oil through feed tube and blend until the pesto is almost smooth. 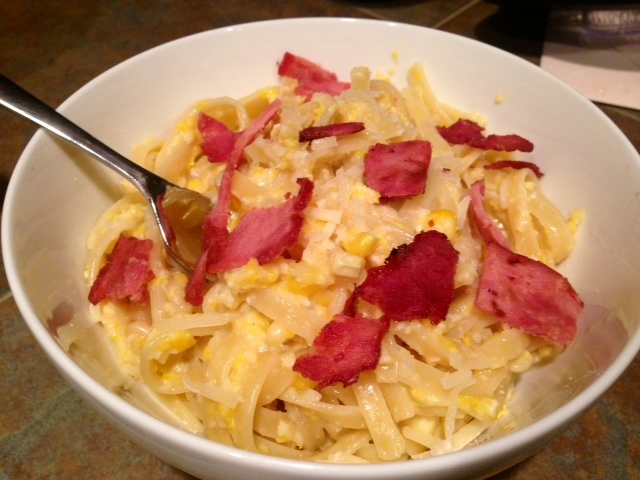 You can put everything together in the pasta pot, a big skillet, or just in a large bowl. I chose the large bowl option. 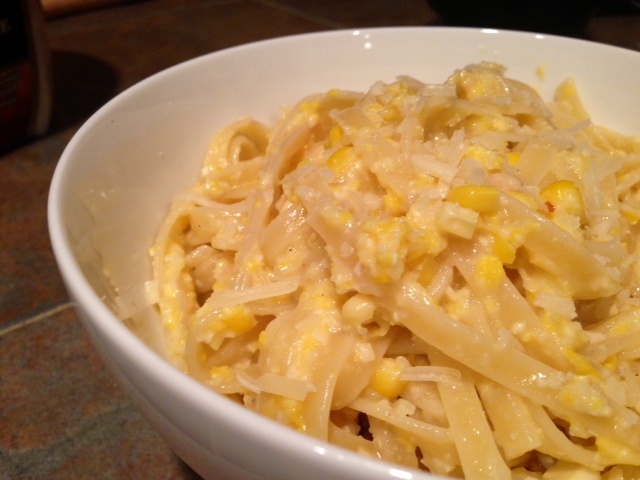 Add the pasta, corn pesto, reserved corn kernels, and half of the basil leaves if you’re using them. Toss everything together with about a tablespoon of butter and the pasta water to make it come together nicely (if you’re doing it in the pan, do it over medium heat). That little bit of butter and the pasta water will help create this awesome thickness to the sauce that will help it totally coat the pasta and stick to it. Serve topped with the bacon and some more of the basil leaves and some parmesan. Enjoy! Cook the bacon in large non-stick skillet over medium heat until it’s crisp and brown, stirring often. Using slotted spoon, transfer to paper towels to drain (not necessary if you’re using turkey bacon). Pour off all but 1 tablespoon of drippings from the skillet. Add the garlic (and a few tablespoons of olive oil if there aren’t enough bacon drippings) and saute for a minute, until the garlic is fragrant. Add the corn, sea salt, red pepper flakes, and fresh-ground pepper to the pan (and the rosemary if you’re going that route—I only used maybe a teaspoon, didn’t want it overpowering the flavor). 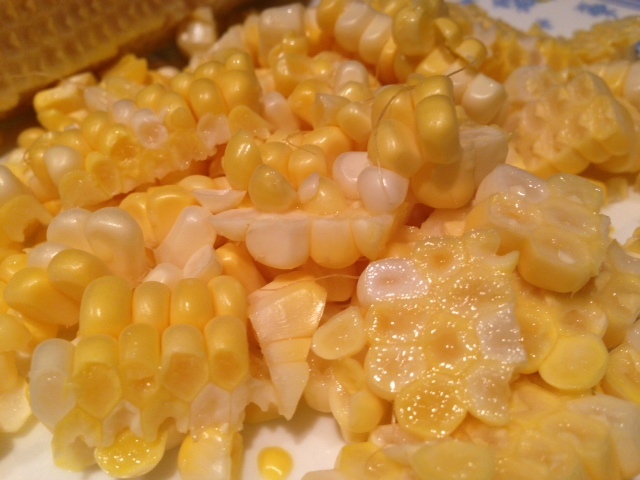 Sauté over medium-high heat until the corn is just tender but not brown. This took closer to 10 minutes for me, though my stove was probably on medium instead. Cook pasta in large pot of boiling salted water until just tender but still firm to bite, stirring occasionally (probably about 9-10 minutes). Reserve about 3/4 cup of pasta water, then drain. 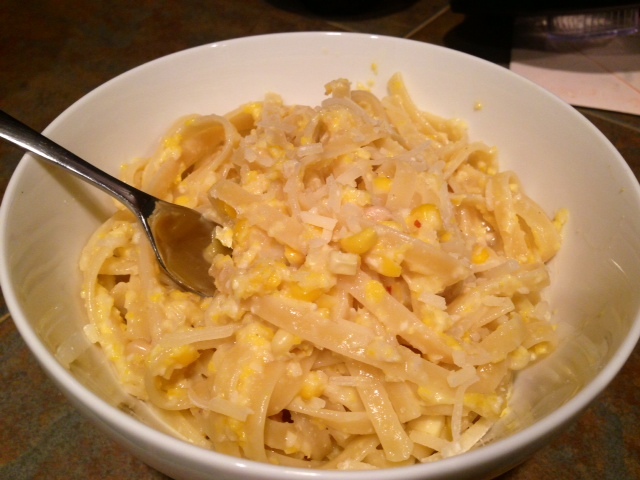 Either in the pasta pot, a skillet, or just a large bowl, add the pasta, corn pesto, reserved corn kernels, and basil leaves if you’re using them. Toss everything together with about a tablespoon of butter and the pasta water to make it come together (if it’s in the pan, do it over medium heat). Sprinkle with remaining basil leaves, bacon, and additional parmesan cheese.